Microscopes have been used in many different fields to observe minute specimens. 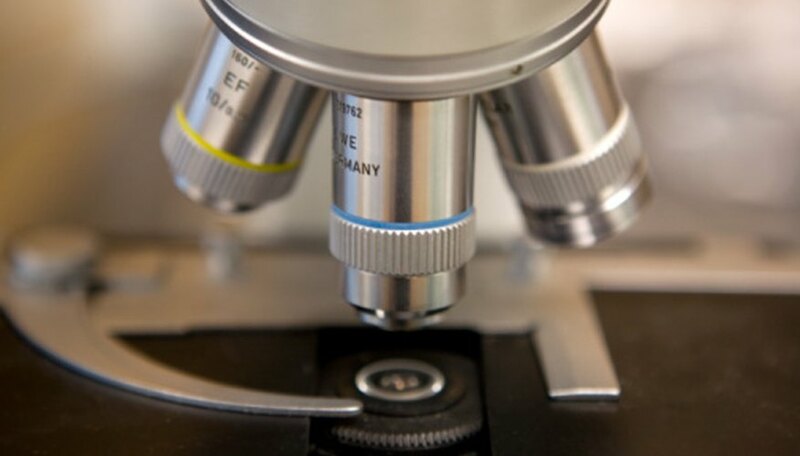 There are various types of microscopes, each with its own methods for viewing different aspects of a given sample. Most microscopes have a set of objective lenses and an eyepiece lens that allow an enlarged image to be seen. A camera can also be added to many of the microscopes to take images to analyze later. Teaching microscopes typically have two sets of eyepieces so another person can see the same image as the person operating the apparatus. The most inexpensive and common microscope used in laboratories is the compound microscope. These microscopes use lenses of various strengths to magnify the objects. Compound microscopes usually have an eyepiece, a set of mirrors and the objective lens that work together. Images are seen in two dimensions. With the help of a microscope camera attachment, the observer can save images for analysis at a later time. The scanning electron microscope is able to observe objects with a 3-D image. Images have high magnification and high resolution, but they appear in black and white. To make the detailed images, a specimen is coated in gold particles. Electrons bounce off of the gold plating to produce the image. This type of microscope is useful in viewing very tiny objects in fine detail and images are saved to be viewed later. Common objects that are viewed are detailed images of bacteria, viruses and some cellular components. This type of microscope uses electrons to pass through a sample. Two-dimensional images are produced by creating thin slices with high resolution and high magnification. Transmission electron microscopes are useful in obtaining images through the thickness of the specimen, not just the surface. Since they are expensive, these microscopes are more likely to be found at major research facilities and universities. Stereoscopes can be used to view objects in three dimensions. The magnification is not as strong as in other types of microscopes, but it does allow you to see details that would not be otherwise seen with the naked eye. They are also called “dissection” microscopes as they are commonly used to aid in the dissection of small specimens. Microscopes can be used to view different aspects of a sample by varying how an image is created. Fluorescence microscopes use specific colors of light to interact with dyes. As the dyes become illuminated, certain structures can be isolated and viewed with their respective dyes. This type of microscope is useful to observe specific proteins within a cell. A camera is usually attached to capture images from the microscope. Youngker, Andrew. "Kinds of Microscopes & How They Are Used." Sciencing, https://sciencing.com/kinds-microscopes-used-8337591.html. 24 April 2017.